A girl waits in line for the water pump at a camp for internally displaced persons in Barsalogho, Burkina Faso, March 4, 2019. Bawenne, Burkina Faso — The Burkinabe village of Bawenne was used to contending with nature, but not the impacts of violence, until hundreds of people started showing up late last year, fleeing suspected Islamist attacks. The displaced had walked for days - some with babies on their backs - to arrive at the village of 2,000 people that was already struggling to survive in northern Burkina Faso's barren scrubland. By March 1, the arrivals numbered 1,200. "This situation can't last," said Bawenne Mayor Ousmane Zango, standing amid crowds of people gathered in the sun outside the village's small round brick huts. "We won't be able to feed them for even a month," he told the Thomson Reuters Foundation. This kind of crisis is new for the entire country, a landlocked West African nation that was largely peaceful until, three years ago, a local Islamist group started to gain a hold. As attacks by Ansarul Islam and jihadists with other affiliations have multiplied, they have set off fighting between ethnic communities in the north, with the Mossi majority accusing Fulani herders of harbouring militants. The conflict has forced more than 100,000 people to flee their homes, more than half in the last two months alone, according to the United Nations. About 20 million people live in Burkina Faso. Since the start of 2019, an average of 1,000 people have fled their homes every day. "Burkina Faso was on a very positive track of development and now it's facing this unprecedented humanitarian emergency," said U.N. Assistant Secretary-General for Humanitarian Affairs Ursula Mueller. "While the government has mobilised the resources they had it's absolutely not enough," she said on a visit to one overcrowded displacement camp. About three in 10 displaced people are in camps, sleeping in tents and receiving food distributions, while the others are scattered throughout the countryside - some in areas too dangerous for aid workers to access, the United Nations said. "For the host families, there's not really a strategy to help them," said Zango, Bawenne's mayor. Bibata Diande was at home near the village of Foube on Jan. 1 when she saw armed men arrive on motorcycles and start setting houses on fire, she said. She ran into the bush and returned that night to find everything destroyed. 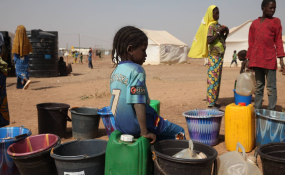 "There was no food or water and the children were crying," said the 25-year-old, who left with her family and now lives in a displacement camp in Barsalogho, about 145 kilometres (90 miles) northeast of the capital, Ouagadougou. About 39 people were killed on the day she described, in the worst clashes to date, and thousands were sent running. The camp at Barsalogho was set up a week later - comprising 86 canvass tents in a patch of semi-desert. The tents are empty but for people. Untreated water is being brought in by truck. "We brought nothing. I do nothing all day," said Diande, who had been in her last year of secondary school. She would like to keep studying but said her notebooks were burned in the attack. The government's humanitarian agency, CONASUR, is managing the camp and three others with help from the United Nations and charities. Its main challenge is housing capacity, said an official. "For the moment, we've covered the needs," said Florent Bakouan, permanent secretary of CONASUR, in an interview. "(But) we don't have more tents," he said. Diande shares her tent with 30 people, but said there is not enough room on the ground, so some sleep outside. At another displacement site, in Foube, a woman said she was sleeping in a school with about 60 people. They had not been registered by the government or offered any aid, she said. The crisis is expected to worsen, said officials and aid workers. The government declared a six-month state of emergency in 14 provinces from Dec. 31. Attacks have multiplied despite the presence of international troops, including a French counter-terrorism force. Aid workers fear the long-term effects, particularly for children. More than 1,000 schools in the affected areas have closed. One secondary school was set to reopen recently in Foube, but progress was delayed because the aid workers organising it were kidnapped, said the school director. "The boys risk being recruited to armed groups and the girls are more vulnerable to early marriage," said David Wright, regional director of international charity Save the Children. Hunger, already a problem in the drought-prone region, will likely worsen as people who flee their homes lose their animals and miss the chance to plant crops, said Abdou Dieng, regional director of the World Food Programme. "We need to scale up fast in order to prevent the crisis from deteriorating," said Mueller. The United Nations estimates 1.2 million people are in need of aid. In Bawenne, some new arrivals have already started building houses. But the mayor said he anticipates tensions come planting time, when everyone will want a piece of land for crops. "The problem of food and water is already there, and more people will come," said Zango, sighing. "Even tomorrow, more could come."